Hookedblog is currently in South East Ireland in one of the countries oldest cities Waterford, for the third edition of the Irish street art festival Waterford Walls 2017. 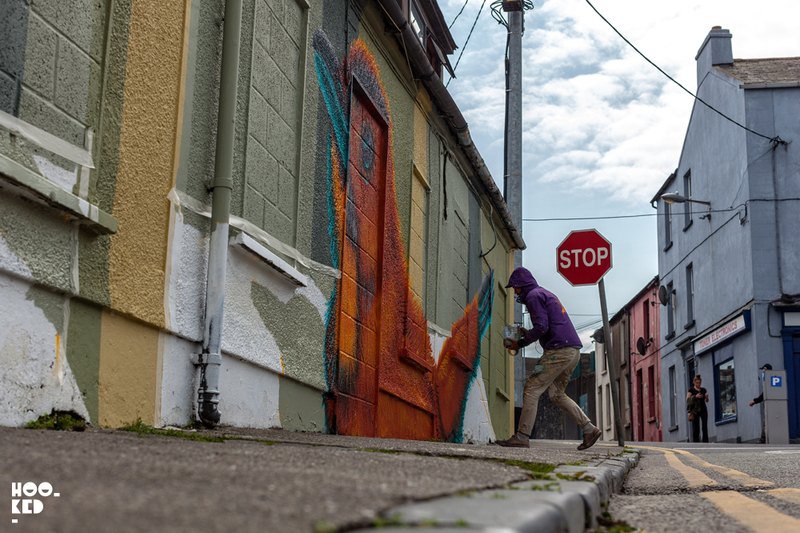 We have spent the weekend pounding the streets of Waterford to capture photographs of the invited street artists at work on their murals right across the city. We have already shared a selection of images featuring the work of French graffiti artist Ador (Previously on Hookedblog) who painted a piece titled The Cloud next to the New Street gardens along with a number of smaller works. Another artist we spent some time watching paint a wall was Canadian street artist BirdO aka Jerry Rugg. 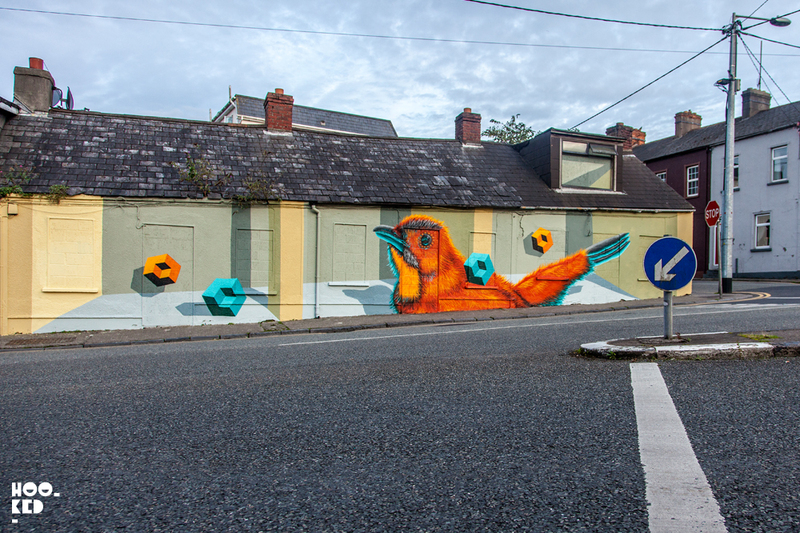 The Toronto artist was back in Waterford for his second visit to the city has taken part in the 2016 edition of Waterford Walls festival. It was our first time meeting the artist although he has been to London where he collaborated on a mural with London street artist Louis Masai (Previously on Hookedblog) who has also contributed to the city walls of Waterford in 2016. Both artists teamed up with London Graffiti to paint a large scale piece on Clare Street in East London which is currently still running (see below). 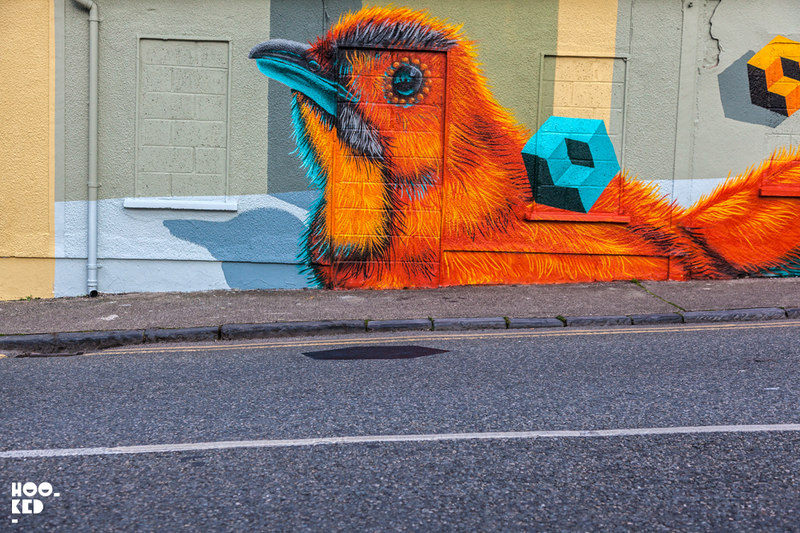 For his Waterford Walls Mural BirdO took over an empty row of vacant bungalow houses onto which he painted one of his vibrant bird pieces which have now been named 'Joey Gunner' by one of the local residents living opposite the empty row of houses. 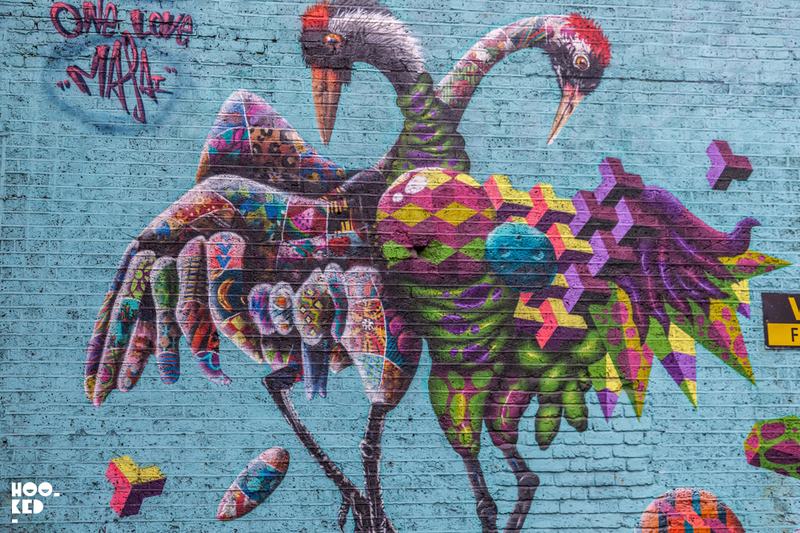 Detail shot pictured above of the East London collaboration BirdO painted while in London with Louis Masai. 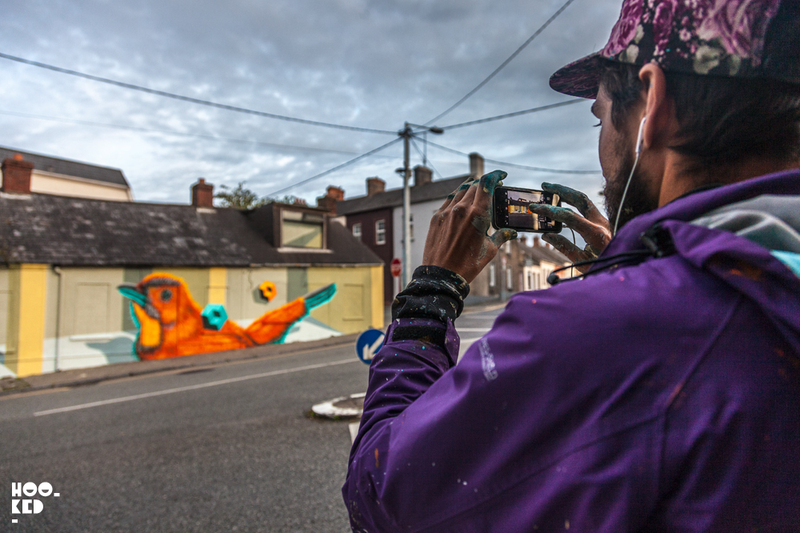 BirdO stepping back to capture a shot of his finished Waterford Mural. 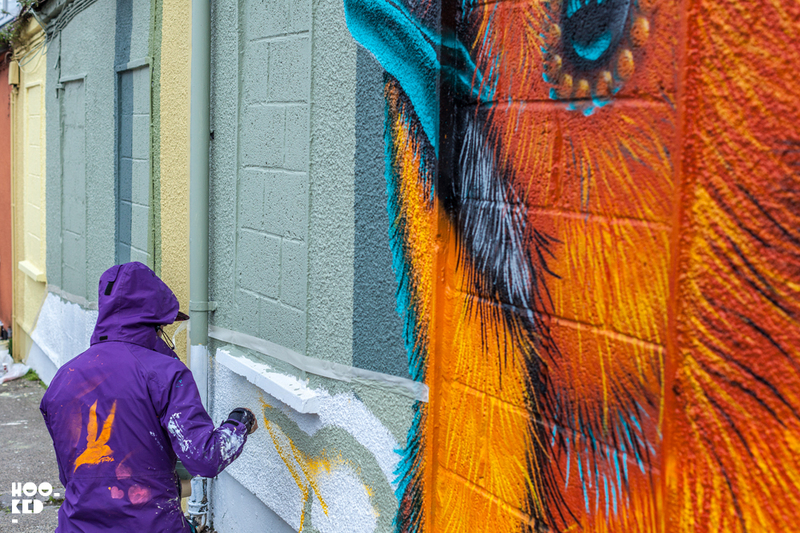 The completed mural from the artist featuring a vibrantly coloured bird that's been named 'Joey Gunner' by one of the local residents whose living room looks across onto the new work from BirdO. The work can be seen in person on the corner of The Glen and Morgan Street in Waterford, Ireland. French Street Artist Ador's Waterford Walls Mural, Ireland.